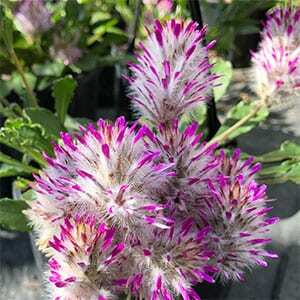 One of the standouts of the genus, Ptilotus manglesii with its rose tipped flowers is making its mark in nurseries. Found from Geraldton through to Albany in Western Australia, this is a brilliantly coloured variety, and it will flower from summer into autumn. Its natural habitat is in gravelly soils in woodland areas, so good drainage is essential to grow it successfully in the garden. The brilliant flowers make this s useful plant for the native garden or indeed a cottage garden that receives good sun. It is suited for mass planting or for use as an edging plant. Common Name – Rose Tipped Mulla Mulla, Pom Poms. Flowers – White with pink to purple tips.